JUSTINE Brownlee and Renaldo Balkman are expected to figure in a neck-and-neck battle for the Best Import award of the PBA Commissioner’s Cup. Brownlee currently leads good friend Balkman in the heated race for the award after emerging as No. 1 in the statistical points heading to the best-of-seven finals between Barangay Ginebra and defending champion San Miguel. The Ginebra import has amassed a total of 54.46 sps.to lead his San Miguel counterpart, who’s currently in second place with 51.03 sps. Meanwhile, four-time MVP June Mar Fajardo is on track to claim his second Best Player of the Conference award for the season as he is the runaway leader in the category with 39.12 sps. No one among the four players behind the San Miguel center are in the finals, making the 28-year-old Cebuano native almost a cinch to clinch a seventh BPC award. Vic Manuel, who was earlier projected to give Fajardo a run for his money after posting more than 10 consecutive games of 20 plus points this conference, landed in third place with 35.44 sps. Fajardo and the Beermen ousted him and the Alaska Aces in the best-of-five semifinals, 4-1. Pringle’s Globalport teammate Sean Anthony is at No. 4 with 33.62 sps, while at fifth is Chris Newsome of Meralco with 31.31 sps. Alaska import Diamon Simpson placed no. 3 behind Brownlee and Balkman with 51.03 sps despite coming on board for the Aces at the tailend of the eliminations as a replacement for Antonio Campbell. He was followed by Rain or Shine’s Reggie Johnson with 47.8 sps. But the race is down to Brownlee and Balkman, who as teammates at Alab Pilipinas won a championship in the ASEAN Basketball League. 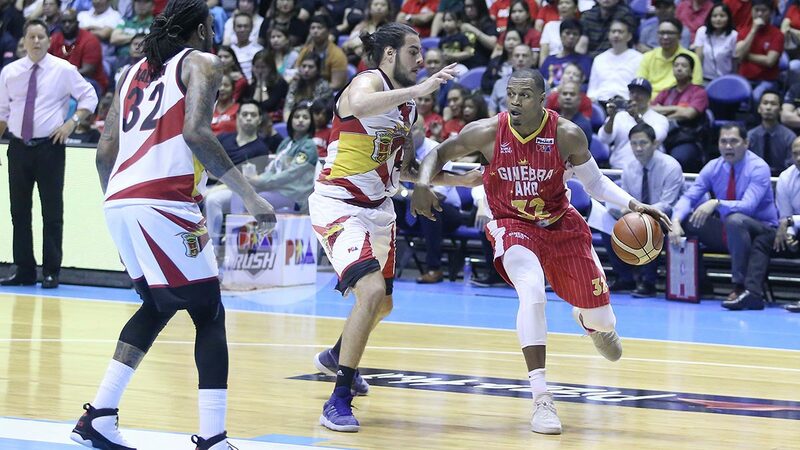 Brownlee replaced Charles Garcia at Ginebra while Balkman took over the spot of Mike Gillenwater after his lifetime ban was lifted by the PBA.